The process for successfully following this article’s headline may seem pretty obvious; hire great people! At a very simplistic level, of course, that is the answer. but as you look deeper into this very important activity the situation appears much more complicated and nuanced. First of all, there is a limited number of “great people” and every software or hardware company wants them for their management team. Suffice it to say that I believe that there aren’t enough “Five Star Athletes” to go around. So it becomes very important to understand not only who you can attract, but what are the MOST IMPORTANT qualities for your particular situation and additionally how well individual candidates will fit with your company’s culture and other senior staff. This process may be streamlined, depending upon the stage of development of your software or hardware tech company. Maybe you’re a mature company and just need to focus on filling 1 or 2 key positions. That will shorten the process considerably. But if you’re a ground floor startup or involved in a situation where there needs to be significant changes in the senior staff, it is important to set aside enough time to do this process justice. Of course like in any planning process, some of the data compiled often is obsolete once you move forward to the implementation phase and reality intervenes. But if you can follow some kind of process similar to that outlined above, it will provide a framework that should serve you well in maximizing the ultimate effectiveness of your assembled management team. Take a serious look at what type of executives you can realistically attract and who you can’t. If you’re a software startup, you’re going to be more attractive to entrepreneurial risk-takers than you are to blue chip, name brand managers. Is your culture based on casual dress, bottoms up decision-making, foosball tables and open office layouts? Or is your culture buttoned-down, very structured with most decisions made at the top? These two extremes will obviously appeal to very different mentalities and personality types. Are you able to match the salary and stability of any potential competitors for the target talent, or is your main attraction a chunk of equity and a company story that could lead to cashing that equity for extreme wealth, if thing go well? The main message here is to understand “what pond(s) you’re fishing in” and stick to those. You’ll waste time trying to hire folks that don’t fit with your specific company profile–and even if you can hire them it often doesn’t work out well. These are generalizations and there are exceptions to everything. But at least taking a look at who you can attract up front can shorten hiring cycles, as well as minimizing major mistakes. One of the big mistakes I see CEOs and other senior tech company managers make over and over again is “hiring their buddies”. Familiarity can be a very important attribute in reducing risk of failure; it can raise confidence levels that that the candidate has the right skills for the job, as well as is a good fit for the company culture. But the mistake I often see is that the personal comfort level between the parties tends to “blind” the hiring manager to “fit” issues – and make them believe that their known candidate is perfect for this new role. Just because someone was a good fit in a previous company, doesn’t mean they’ll do well in this new role and new company. While familiarity can be helpful, sometimes change is good. If a pool of candidates is limited to people that you already know well, the talent pool will be very shallow and you run a high risk of not hiring a the best available person from a skills perspective — and maybe even the best fit from a cultural perspective. If you don’t take some chances and hire unfamiliar people, your network will stagnate and your management team will likely end up to be a sub-optimal group, relative to a more open approach to hiring. Some technology company executives are great in startups, while others thrive on the growth phase and a third group are best at managing the complexities of more mature, bureaucratic organizations. Realizing this, it’s important to consider what stage of development an executive enjoys and has successfully experienced, when considering candidates. Of course, these are generalizations and there are great executives who can thrive in more than one, or even ANY software or hardware company stages. But it is one more factor that deserves consideration when evaluating the “total package” of individual candidates. Preference deserves to be given to those executives that profess to thrive — and can demonstrate that they have previously done so — in the development stage of your particular technology company. This “test” is similar to the talent vs. familiarity discussion above, but slightly different in important ways. At the extreme you might find one candidate who’s skills and resume fits perfectly with the needs of the role, but is a questionable fit culturally. Another candidate might have a much weaker resume and skill set, but you’re certain he will fit in and work well in your company environment. Who do you hire? In reality, it’s unlikely that you’ll have to choose between two candidates at such extremes; reality more often presents various “shades of grey”. But this illustrates that for each individual senior role which you are hiring, it is important to have a sense of the relative importance of skills/resume vs. cultural fit. Some roles may allow someone with a strong background, but a weaker cultural fit, to operate relatively independently and be a major asset to the company. But that same type of person in a role where intra-company interaction or consensus-building is to be a critical component may be doomed to failure. Lastly I want to present one aggregate criterion which is probably the least obvious in the list. That is diversity of approach and personality in your overall management team. I think that sometimes in an effort to find folks that “fit the culture” companies run the risk of hiring “cookie cutter” types of senior managers. This can lead to “blind spots” in decision-making, if everyone approaches issues similarly and generally “think alike”. I’m really speaking about diversity of thought and personality here; but I believe that diversity of race, gender, background, etc can be very helpful in reducing this potentially uniform approach to business. Having a mix of people, some who are very agreeable, some who are challengers, leaders and followers can actually result to a more creative and functional management team. An example I’ll provide is a company I worked at early in my career. The top management team was filled almost uniformly with very smart, “A” personality types who were hard-charging, relatively undiplomatic and all determined to set the agenda. What resulted from this look-alike pool of management talent was a dysfunctional team with constant clashes, continuous in-fighting, politicking and poor communication. This was the result of a CEO hiring in his own image: people he viewed as having the qualities of a “winner”. The moral of this story is that it takes more than one type of executive to win; the parts must fit together in a coherent team where everyone understands their specific role. So there’s my view on the most critical items to get right, if you want to assemble a software or hardware company management team which “fires on all cylinders”. What does your list look like? This is obviously a very subjective topic — I would love to hear your view. 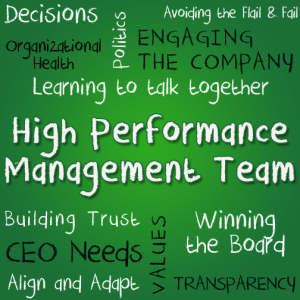 Post a comment to with your approach to assembling a top-notch tech management team!